I have for many years felt that old motorcycles are very exciting. 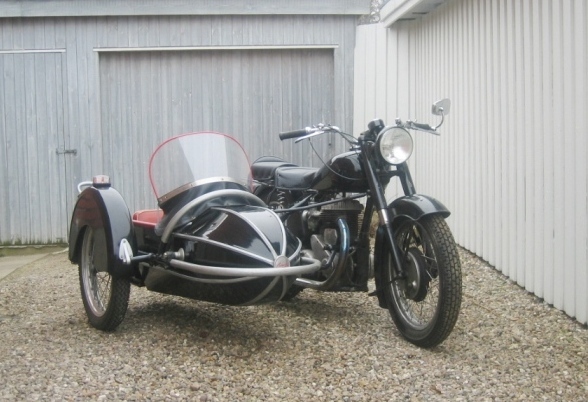 Especially the old English motorcycles with their bold sound I find more exciting than the Danish 4cyl Nimbus. I wanted a big slow engine with great torque, like a 1 cylinder. So the choice fell on the largest single cylinder model BSA ever built. The M21! I found a reasonably neat and running M21 on Sj�lland (DK). On closer examination I found the M21 was not original, built with a little of this and that from various bikes. There was no cush drive and the clutch was from a much later model. After some searching I discovered that what I have, is a BSA M21A, A = Alternators. The BSA factory had changed the crank and clutch to make room for a 12 volt generator / alternator. The Alternator model was only produced and sold to the AA roadside service in limited numbers from 1961-63. It was delivered to military service without badges and knee rubbers.